Plot: Running a diamond smuggling pipeline between Africa and the USA. 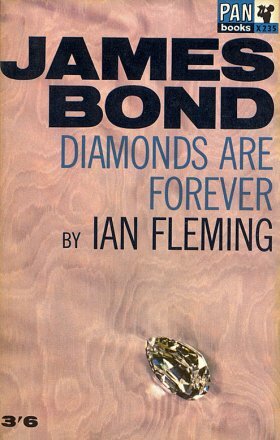 Bonds assignment is to infiltrate a diamond smuggling operation, which is running from Africa to America, and identify the gangsters behind it. Once there, he discovers the American gangs are more efficient and ruthless than he had expected. The M took the pipe out of his mouth and drily gave Bond the details of his assignment of which M was afraid. And Bond walked out of the Headquarters of the Secret Service and into his greatest adventure. 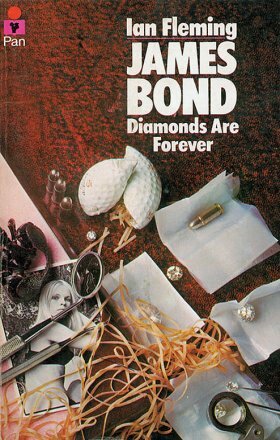 After an opening scene involving the killing of a scorpion, Diamonds Are Forever gets going with Bond being called to halt smuggling of diamonds out of Africa. The main link is a diamond shop in London owned by Rufus B Saye, who is believed to be the end of the pipeline. Bond then takes the place of captured courier Peter Franks at his assigned meeting with Tiffany Case. Bond must smuggle $50,000 of diamonds to ‘Shady’ Tree in NY. 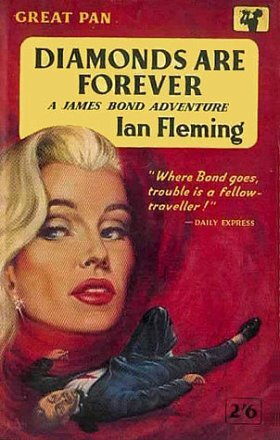 She then reports to the mysterious ‘ABC’ to expect Bond as the courier. 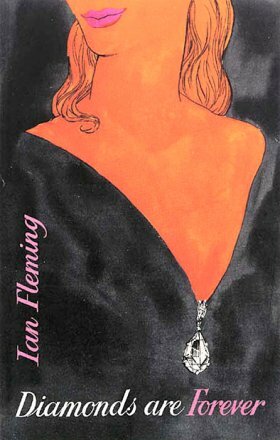 Bond delivers the diamonds, and is told to bet on a fixed race. However, Bond helps Felix Leiter, who is now missing part of an arm and a leg and working against American race-fixing syndicates, to alter the result of the race. Bond sees the jockey punished when his face is covered in boiling mud from a mud-bath. Bond does pick up his payment of $5,000 at a fixed table of blackjack (Tiffany is the croupier) but he then disobeys his orders by gambling it up to $20,000. Serrafimo Spang, the head of the ‘Spangled Mob’ of American gangsters captures Bond and plans to make him pay the penalty for his greed. Spang’s brother, Jack, is believed to be the elusive ‘ABC’. However Bond escapes with the help of Tiffany from Spectreville, Spang’s mock Wild West town. They just manage to escape back to the Queen Elizabeth, but Spang’s homosexual henchmen, Wint and Kidd, are ordered to kill Bond and Tiffany on the ship. But Bond just manages to outwit the villainous pair. Back at London, it is discovered that Jack Spang is RBSaye (hence the cryptic codename). However, Spang is returning to the Sierra Leone site of the prologue to shut down the smuggling ring. Bond arrives in the nick of time to help destroy Spang’s helicopter. Tiffany: "Got a wooden leg? False teeth?" "No. Everything's real." She frowned. "I keep telling them to find me a man with a wooden leg." Cureo: "If I were you, I'd think a long time before joining our little group. Don't go and get in wrong with the mob. If you're planning anything cosy you'd better start taking harp lessons." Tiffany: "That guy's so loaded, he don't wear glasses when he drives. Has the windshields of his Cadillac's ground to his prescription." Bond: "Most marriages don't add two people together. They subtract one from the other." Tiffany: "But it depends what you want it to add up to. Something human or something inhuman. You can't be complete by yourself."